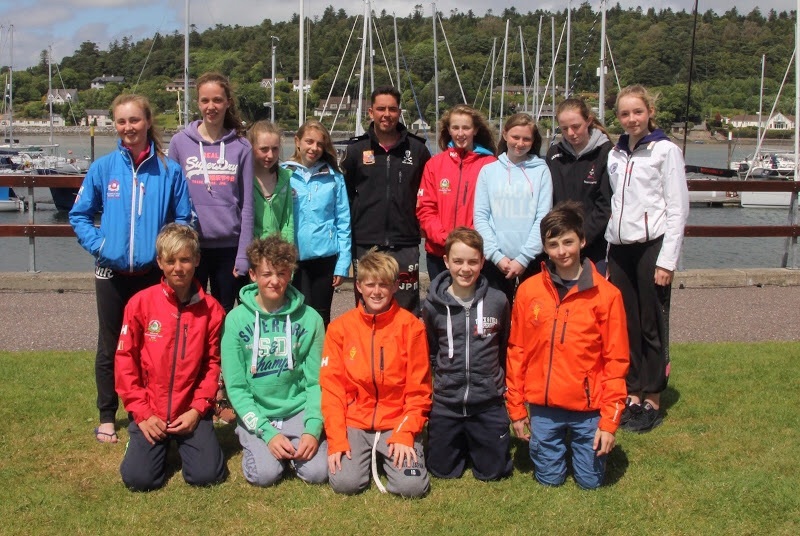 The 2016 Irish Topper Nationals were hosted by the Royal Cork last weekend (2nd to the 4th July) and what a fabulous event it was. 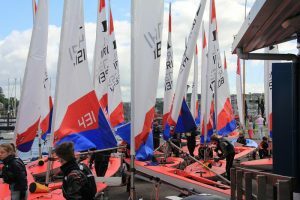 The sailors experienced a full range of weather, tide and sailing areas to fully test the 62 strong fleet, with sailors competing from throughout Ireland and Great Britain. The ever growing Royal Cork fleet of nearly twenty top class sailors (most of the group pictured below) were more or less all competing and accounted for at the event. Saturday saw racing in medium light north westerly winds in Cuskinny with PRO Dave O’Brien managing to get three races away. The wind, of course, settled back in to the south west for going home, but thankfully the club were in a position to tow sailors home! Sunday morning brought very calm conditions which had Brian Jones and Dave O’Brien out surveying both race areas for wind. It was decided to AP the fleet ashore and wait for the tide and wind to fill, which it duly did to allow four races to be run on the Curlane Bank in 8 to 12 knot SSW breeze and glorious sunshine. Unfortunately, from a club point of view, not all of our sailors managed to capitalise on sailing in our own ‘back yard’. Mikey Carroll (RCYC/KYC), who had faltered somewhat on Day one was finding his form on Day two with two bullets and a fifth but unfortunately attracted a U-Flag causing some costly statistical scoring problems. Our own Sophie Crosbie was now showing that consistency was going to prevail. With the spring low tides dictating a travel to race areas further afield, it was decided on Day three to re-visit Cuskinny, where a heavy mist and SW winds were building up to 20Knots. Two races were run in very testing conditions with the waves building down the course. Nicholas Welbourn (Hykeham Sailing Club) completed his Nationals campaign with two bullets to lead overall (after all discards applied) from Jack Fahy (RStGYC/LDYC) by 5 points. Jack as first Irish was subsequently crowned National Irish Topper Champion 2016. Sophie Crosbie (RCYC) held off Angus Kemp (Poole YC/Parkstone YC) by one point to claim Third Overall and First Lady. Mikey Carroll (RCYC/KYC) was 1st Under 17. Sarah Levie (RCYC/LDYC) was 3rd Under 17. We had a very large number of our Royal Cork sailors finishing in the top half of the fleet which augurs well for all of them competing in the topper world championship later this month in Ballyholme. Finally, a really insightful video roundup of the sailing side of the event was taken by Digby Fox who managed some magic on an IPhone!